A few days ago we reviewed a new platform from Microsoft called Microsoft Educator Community, a site which helps teachers and educators collaborate with each other, grow professionally and make a better use of technology in their teaching. Today we are sharing with you another great resource from Microsoft related to live webinars for teachers professional development. Microsoft Educast ‘is a fresh series bringing together academic leaders, innovative institutions and pioneering educators in a monthly series for educators. Connect with educators around the world as this live interactive webinar platform allows you to chat with attendees globally-- share your ideas as you hear from speakers on the hottest topics in EdTech, then engage in live Q&A directly with the presenters’. Attendees in these webinars will get certificates. To join Educast webinars you will have to register. Registration is free. Here are some good upcoming webinars you may want to attend. Check out the full list of webinars from this page. 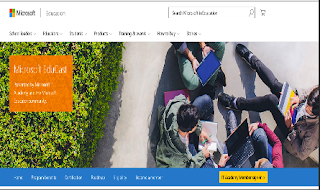 Microsoft EduCast: One Amongst Many: Pathways to a Connected Educator with Microsoft (12 January 2016 8:00 - 9:00 AM PST). P.S: We are neither affiliated with nor sponsored by Microsoft.